The current onset of el Nino is raising hope in California to replenish some of its multiyear water deficit. Due to the warm pool of water on the East side of the Pacific, more rain, and consequently also larger potential for flooding is expected. At the other side of the Pacific, the water is colder than usual leading to Australia bracing itself for a period of drought. Besides sea surface height and temperature changes, these precipitation patterns move water masses which are even detectable in the time varying gravity field of the Earth. It would therefore make a lot of sense to integrate gravity field data within drought and flood monitoring schemes. The German-American Gravity Recovery and Climate Experiment (GRACE) already supplies this information, and has proven to be very valuable for climate studies. These range from studies of the mass variations of the world’s major ice sheets and glaciers and their impact on sea level, to studies focusing on anthropogenic uses of groundwater resources. 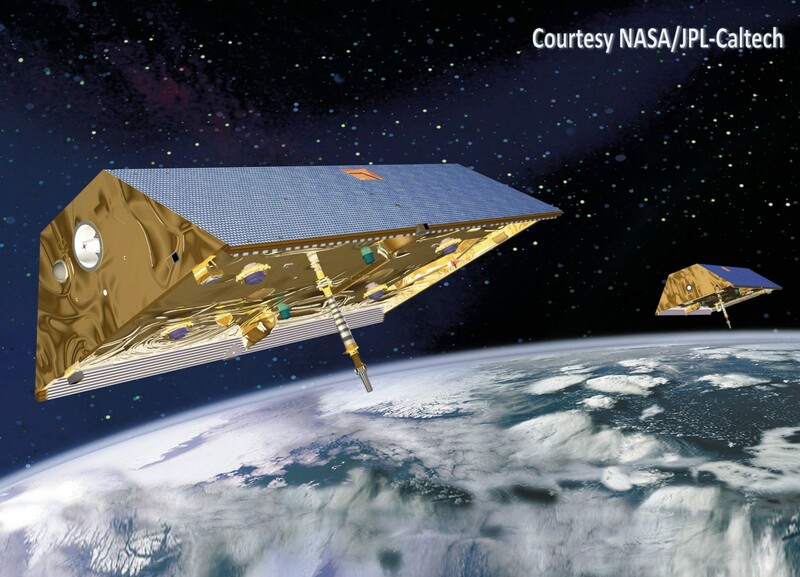 GRACE is therefore very interesting for operational flooding and drought management, however, the time it takes from the raw in-orbit GRACE measurements to become a widely usable product takes roughly 60 days. In order to embed this innovative gravity field data into operational systems this time needs to be reduced. In light of this, the EGSIEM consortium (European Gravity Service for Improved Emergency Management) are striving to provide a solution to the lack of prompt, uniform environmental mass redistribution data from the GRACE mission. EGSIEM is a three year research and innovations project funded by the European Union under their Horizon 2020 Programme. It brings together around 20 scientists from geodesy and hydrology backgrounds around Europe who are taking a holistic approach to Earth Observation (EO) Data with the end goal of providing faster, standardized gravity field data. Such products may facilitate not only a broad scientific community, but are also of benefit for the general public who live in areas under threat of large-scale flooding and drought events. Changes in continental water storage conditions form (arguably) the most significant portion of mass redistribution data which, depending on local conditions, may lead to severe flooding and drought events. EGSIEM aims to demonstrate that observations of water and ice mass redistribution derived from satellite gravity data can provide critical and complementary information to more traditional EO products. 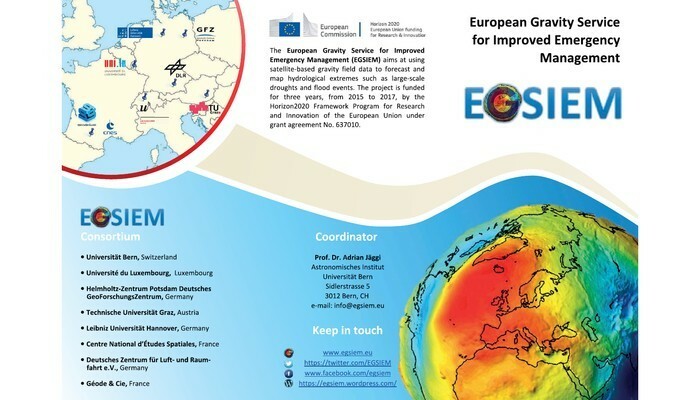 “By offering improved and timely gravity fields, we want to encourage and open up novel approaches to flood and drought monitoring and forecasting” says Adrian Jäggi project coordinator of EGSIEM. The project’s main aims are: To provide a scientific combination service which will, using the knowledge of the entire European GRACE community, deliver a robust standardization of gravity-derived products. Reducing the current delays in provision of observations, such a near real-time service aims to reduce the average time of gravity field products from the current 60 days to five, and for initial Level 1 instrument data from 11 days to one. Also, by developing gravity based indicators for extreme hydrological events the EGSIEM team aim to demonstrate their value to flood and drought forecasting and monitoring services in a hydrological early warning service. 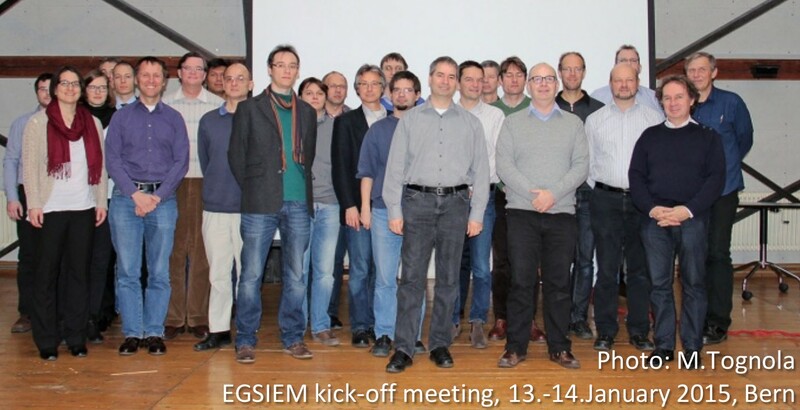 The EGSIEM team proactively maintain their impressive looking website (www.egsiem.eu), where scientists working in the field of gravity recovery and hydrology regularly post blog entries of their findings. According to Keith Cann-Guthauser who is the EGSIEM project administrator: “a key strength of EGSIEM is our engagement and effort to disseminate our findings to a larger audience.” The website further offers a direct visualization of satellite gravity field data with the EGSIEM plotter, and a possibility to sign up for a quarterly newsletter. Keith Cann-Guthauser (front row second right) and Adrian Jäggi (front row center) are based at the Astronomisches Institut, Universität Bern. Should we, as session conveners, have an expiry date? 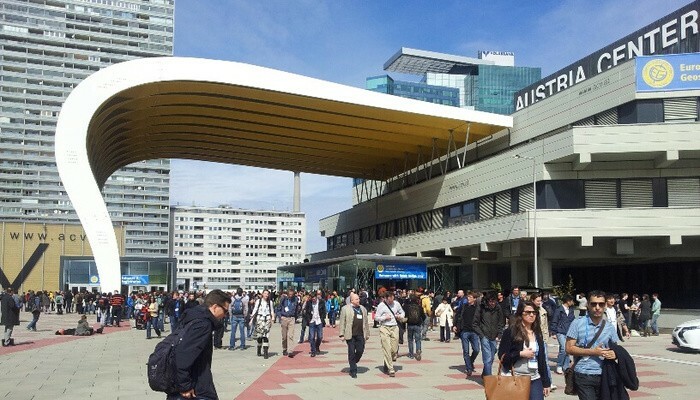 This is a guest post written by Jürgen Kusche, who has convened numerous sessions on various international conferences, and had the wonderful idea to use the geodesy division blog to initiate an open discussion on the topic session convening. For that reason, readers are encouraged to comment at the end of this post. Currently, Jürgen Kusche is professor at the Chair of Astronomical, Mathematical and Physical Geodesy at Bonn University in Germany. One of the nice things of the EGU way of organizing a conference is that everybody can suggest sessions, not only the ‘officials’. This is an important option to allow young scientists develop experiences and a sense for service to the community. It also allows to create sessions more ‘adaptive’, e.g. in order to support spectacular new findings from some satellite data release, or in response to natural disasters. But maybe the system has become less flexible now. I notice that some geodesy sessions are organized by the same distinguished scientists nearly over decades. While this has its merits, as it guarantees continuity and the highest level of scientific knowledge in organizing the sessions, sometimes it may congest the path for creating new sessions by new, younger convenors. True, everybody is invited to propose a session and one may argue, let the new ones compete with the established ones in terms of abstract submissions. But this does not work well since all session proposals tend to be formulated very wide in order to attract contributions. Having too many sessions competing for the same group does not make the program attractive. This may be an argument for simply limiting the convenor service, in the same session, to terms of, say four years. This way, new people would be brought in. True, the EGU rules do not allow that the division presidents stipulate, let alone enforce, such rules. But we, as G division, might give us a code of conduct? 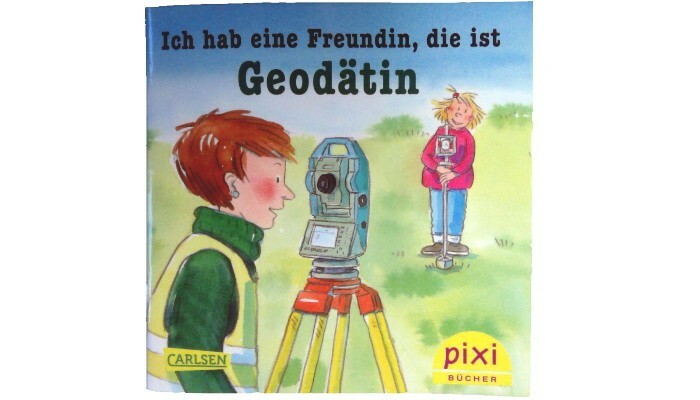 Recently, I came across a tiny (10 x 10cm) book called “Ich hab eine Freundin, die ist Geodätin” (“I have a friend, and she is a geodesist”), by Sylvia Schuster with drawings by Dorothea Tust. Virtually all of my colleagues were quite sentimental about this since it was published as a so-called ‘Pixi-book’. And Pixi-books, as I learned, are the de facto story books in Germany to explain children the joys and challenges of day-to-day life. Consequently, for most Germans, these books will cause pleasant vibes and leave them day-dreaming with early memories. The book tells a story about a little girl called Jule, who visits a parcel, where her new home will be built. Accompanying Jule is her friend and geodesist Gaby, and together they use surveying instruments to place markers, so that the construction workers know where to build the house. Later on, by measuring the dimensions of a neighboring house of her friend Philipp, and the height of a newly built bridge, Gaby explains Jule the basic workings of a tachymeter and levelling instruments. A few days later, Jule is shown how the measured data is imported on the computer, and how maps are made from it. To be honest, coming from an aerospace engineering background, I myself have not even as touched a tachymeter, and identifying myself with a surveyor seems a little farfetched. To me, a geodesist can do many other things besides traditional surveying, such as, for example, measuring Earth deformation changes caused by loading from the Earth’s water cycle. Nevertheless, I find this booklet very appealing for three reasons. 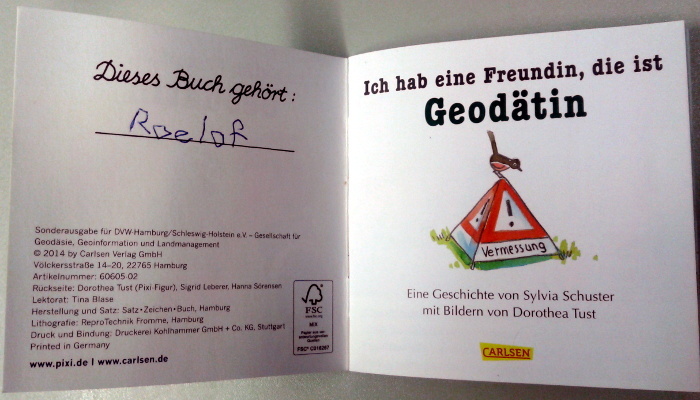 (1) It targets a very young audience, and provides them easy to understand narratives on the topic of geodesy. I see no harm in brainwashing the little ones a bit, as long as it is for the sake of understanding geodesy. And besides the kids, I’m sure that a lot of grown-ups can learn something from this 24 page booklet. (2) A female is featuring as geodesist, actively engaging stereotypes. In a perfect world, this fact shouldn’t even have caught attention. But in reality, women are still underrepresented in these fields. I’m happy to acknowledge an exception though, as there are plenty of highly capable female co-workers in my direct working environment. (3) It’s excellent communication material with a smile. I can only applaud this successful initiative of The German Association of Surveying (DVW, Hamburg). And I’m eagerly awaiting further editions like “I have a friend, and she is geoscientist’ or “I have a friend and she is a climate-scientist”. “This book belongs to”, for an authentic look, make sure to fill out your name with your non-dominant hand. Measuring with sub-mm accuracy, who cares? WE DO! Welcome to the official blog of the geodesy division of the European Geoscience Union. Hosted by the EGU (thanks for that! ), the blog is currently being brought into life by the geodesy division presidents and myself. Of course, anyone who has even the slightest curiosity towards geodesy is happily invited to pay us a regular visit. 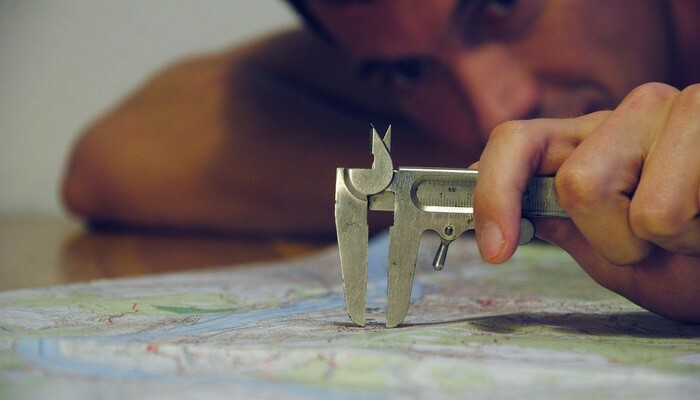 To stigmatize right away, most geodesists will probably be, either directly or indirectly, involved in measuring the Earth (shape, gravity, rotation) with ridiculously accurate measurement equipment. As a result, geodesists tend to get very excited when they see numbers change somewhere in the 8 digit behind the decimal. At first sight, this seems like a pretty boring occupation, but we would like to convince you of the contrary. By posting here, we want to convey findings of geodesy related research in an easy-to-digest format, and show the world that we (geodesists) are actually doing pretty interesting and highly relevant work. Furthermore, we’re looking forward to add some personal seasoning to the blog by providing, for example, insights into field work experiences. Of course, news from the EGU Geodesy Division itself will also be posted here. We’ll be on the lookout for interesting/important/funny/visual(!) stuff, but it will be even better if you contact us directly if you have something to share.